Lite version includes letters A to F to allow you to experiment before purchasing the complete set. Our preschool Abc Game application makes learning Alphabet fun and easy with kids-friendly games. * Abc Alphabet Game app will keep your kids entertained, educated and quiet in a car, in a restaurant, on a plane or everywhere. * Abc Alphabet Game app includes interactive and adaptive games for preschool kids. * Abc Alphabet Game has cute graphic images. * Abc Alphabet Game includes a puzzle game that is great for helping kids' brain develop and grow. * Abc Alphabet Game is very easy to use. * Abc Alphabet Game is designed to develop comprehension skills. * Abc Alphabet Game will develop their concentration. * Abc Alphabet Game will develop kids' cognition skills. * Abc Alphabet Game will help with the recognition of letters of alphabet. * Abc Alphabet Game user interface is simple with guiding clear images for kids. * Abc Alphabet Game will help your kid's memory training. * Letters : A to Z letters with pronunciation and cute object graphics. * Hippo Memory Game : Hippo Memory Game is designed to teach kids Uppercase letters by using recognition, concentration and cognition skills. This memory game also includes pronunciation of letters. This cute hippo memory game will keep your kid entertained and educated. * Fish Game : Fish Game is designed to improve kids listening and pronunciation skills. Letter recognition along with sound. Your kid will have fun while trying to catch letters! * Puzzle Game : Letters Puzzle Game includes puzzles for each letter. This letter puzzle game is designed to teach kids letters' shape with cute cartoon animal. When your kid does puzzles, they are doing one of the best brain building exercises for developing their reading and logic skills. Your kid will love this puzzle game and play it over and over again! 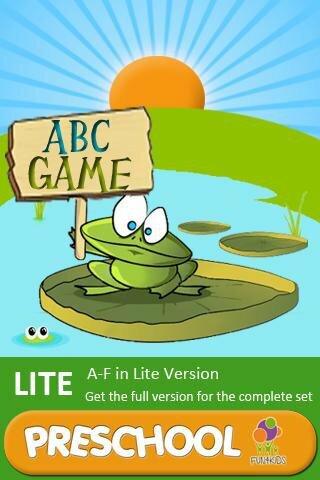 * Frog Game : Frog Game is designed to teach lowercase-uppercase match with cute frog graphic and letters sounds. If the answer is correct, the frog will make sound! * Apple Memory Game : Apple Memory Game is designed to teach Lowercase letters by developing recognition, concentration and cognition skills.